I'm excited to introduce Loy from Grandma Loy's Kitchen as we start another week of guest posts here at Morsels of Life. I first "met" Grandma Loy when linking up my Five Friday Finds. Grandma Loy's always got some sweet treats picked out - things you'd expect to come out of grandma's kitchen. 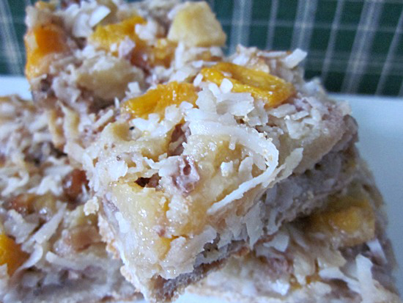 :) Let's all give Grandma Loy a warm welcome as she shares her Peachy Pear Dream Bars! First, I want to thank CJ for allowing me to post on her wonderful blog. We "meet" most weeks over at Finding Joy in Your Kitchen when we link up to Friday Favorite Finds. I am always anxious to see CJ's picks for the week. If you are popping over from my blog, Grandma Loy's Kitchen, stick around awhile and check out CJ's great recipes. 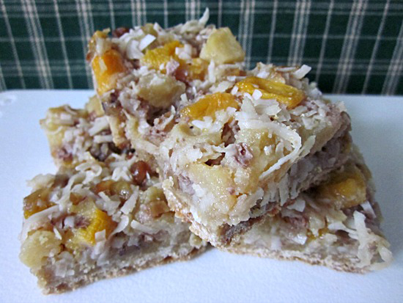 Peaches, pears, coconut, and nuts atop a shortbread crust. Transport yourself to the midst of summer anytime by eating these cookies/dessert bars! The recipe I am sharing today is a very adaptable one. It can be made with canned peaches and pears, only peaches or only pears. It can be made with fresh fruit in season, although the fruit must be diced small, and the bars will need to cook a little longer. This may be served as a bar cookie or cut larger and served as a dessert. I top it with whipped cream or whipped topping. Cut as bars, these make an interesting addition to a holiday cookie tray. Although I did not add them in the bars in the photo, half a cup of well drained and quartered maraschino cherries can be added for color. Chop fruit into about a 1/2-inch dice and set aside. Combine 2 cups flour and 1/2 cup brown sugar. Cut in butter until mixture resembles coarse meal. Pat firmly into a foil lined and greased 9x13-inch baking pan. Meanwhile, beat eggs, vanilla, and almond extract until light and lemon colored. Combine 1 cup brown sugar, 1/2 cup flour, baking powder, and salt. Gradually add to eggs. Add diced pears, peaches, coconut, and nuts. Mix thoroughly. Spread mixture over warm crust. Bake 20-25 minutes longer or until lightly browned.